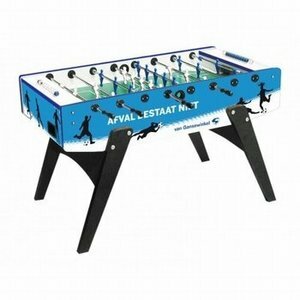 Looking for a football table in your own style. We print your football table in your own house style. Images, company name, etc. are all possible. Fun for the sports canteen for the sponsor. Or in the company with company logo. 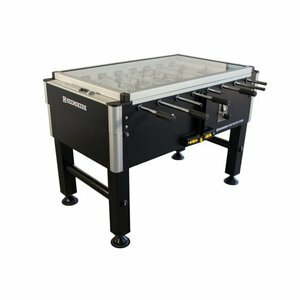 There is a lot possible with the printing of a football table. Usually the sides are printed. This means the entire exterior. So both the short and the long sides of the football table. Of course it is also possible to have the inside or playing field printed. The football dolls are included in the color as much as possible. What is more beautiful than to convey your message through relaxation. Just a game of table football in the break. Or after a hectic moment. Blow off steam around the foosball table. They have already led many companies such as Sonny, Intersport, Jupiler, DHL, Albert Heijn etc. But also several football clubs have a printed table. How about AC Milan or Bayeren Munchen. 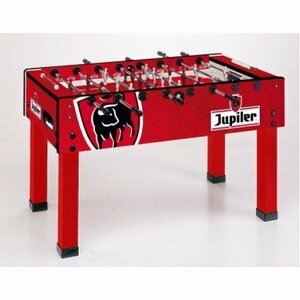 Football tables that are very suitable for this are Garlando G-500, G-2000, Olympic or the World Champion. Or you supply the designs that we deliver to the file. But we can also make the design. You then indicate what you want. You can approve this after a digital design.